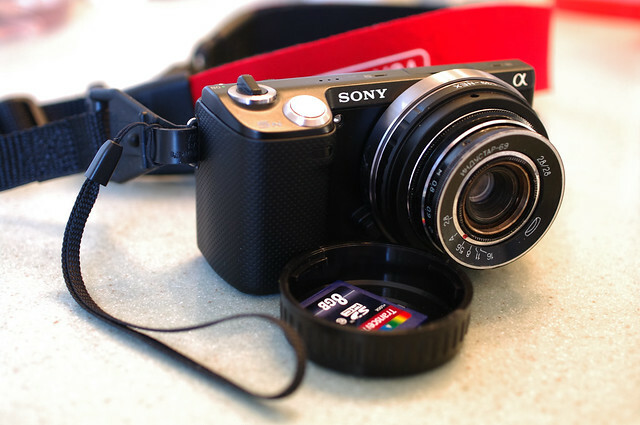 Due to the bulky size of the M42 to NEX adapter, the lens loses the pancake appeal on my Sony. It looks better when I mounted it on Pentax dSLR. 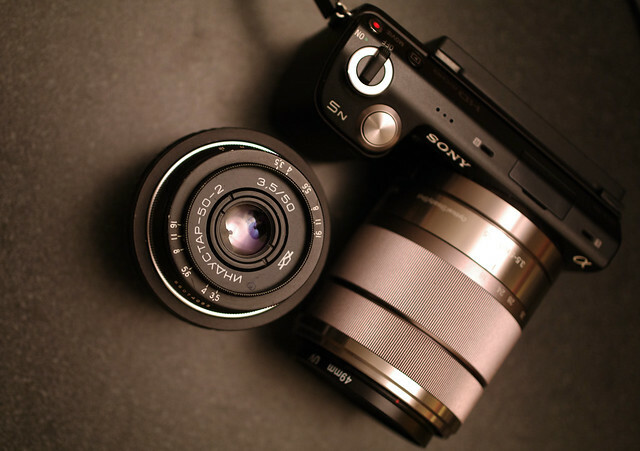 It is very small lens for a 50mm. Any user experience on this Russian pancake? 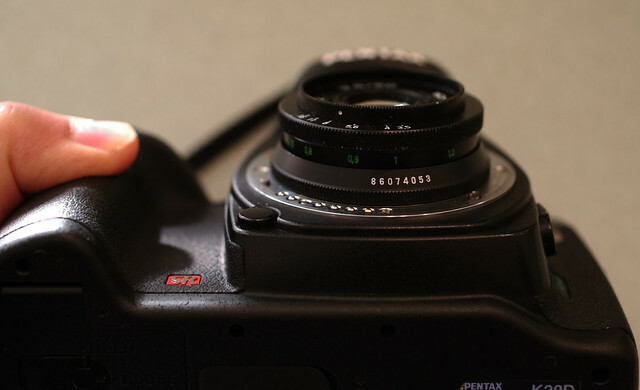 It is quite a cute pancake lens when mounted on Pentax dSLR. Last edited by hinman; 01-13-2012 at 09:27 PM. I am using the Industar 50mm f3.5 m39 version mounted with an adapter to the m42 Pentax adapter. Unfortunately, it comes close to focusing to infinity but not quite. Still, a very lovely lens to work with, offering interesting bokeh and a romantic feel to many images. I need to get a hood, for the lens has a tendency to catch sunlight from the side, and to better allow me to rotate the tiny aperture ring. The bokeh and sharpness are wonderful. I have the M42 version and hence I don't have issue with infinity focus. I actually prefer the M39 mount as the M39/L39 to NEX mount adapter is a much thiner and smaller adapter. The pancake appeal will work better for this lens in M39 mount. I may want to trade in my M42 version to M39 later in marketplace but currently I need to play with it more on Pentax to be sure. 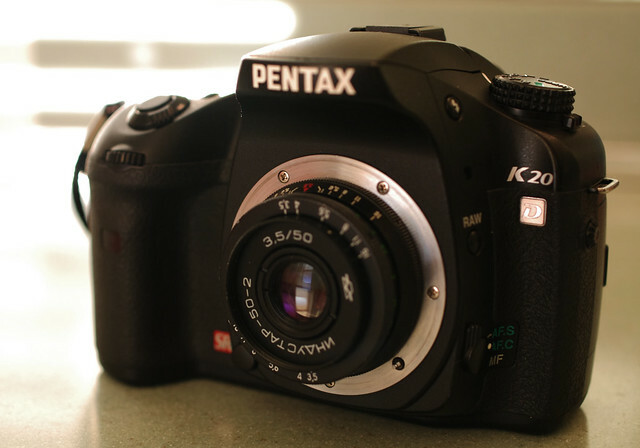 The M42 mount works better on my Pentax than it does on my Sony NEX 5N. It will be a challenge to get a hood as an added hood may obstruct the aperture change on the lens front. It will be great to find a hood that does the job though. I tried both 37.5mm and 37mm lens cap and both fail. My first lens cap in 37.5mm size is from Pentax Auto 110 50mm f/2.8 lens and initially it can fit but mine gets broken after two weeks of use due to tight spacing. And my 2nd attempt with a generic 37mm cap strangely become too tight. It is likely a 35.5mm cap size but I am unsure. Please do share the hood/cap/filter size when you find one that works well and I will do likewise. Last edited by hinman; 01-14-2012 at 10:16 AM. I'm on my second I50. The first was M39 but focus was too sticky for general usage -- I mostly put it on macro tubes. About a year ago I sold it for the price of a newer I50-2 in M42. Silky smooth focusing, no problems. In the course of my eBaying I came upon an EL-Nikkor 50/4 with a Nikon lens cap marked 34.5mm. This cap now lives on the I50-2 where it snaps on very tightly. I still haven't come up with a good hood solution. Ratz. A step-up ring of 33mm-43mm then another ring 43mm-49mm. I-50 for M39-L39 rangefinder as per M39 SLR, but this lens is not useful on DSLR, but OK on NEX. It is a bit tricky to see the aperture settings with the rings fitted and if you touch the hood whilst focusing, the settings alter, but that's how it is. If you prefer, genuine push on hoods and caps are still available from alex-photo and others in Ukraine on ebay. Thank you so much. Other than the infinity focus, do you find similar optics and performance on the two lens that you have in M42 and M39? I may be going the opposite route of your purchase in getting a M39 version after my M42. And I may keep both with the M42 for my Pentax use while the M39 seems more fitting on my NEX due to smaller and thinner M39/L39 to NEX adapter. 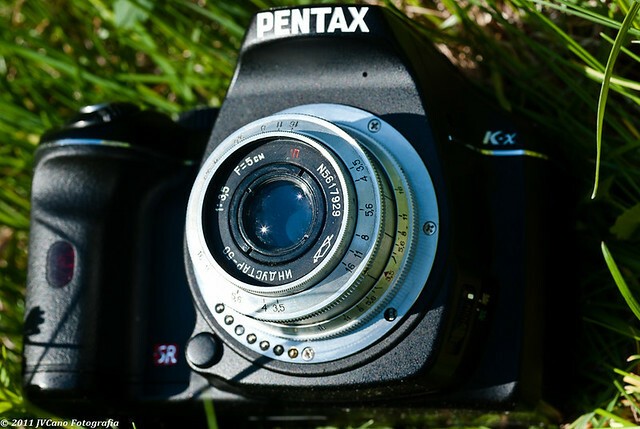 When the lens is mounted on Pentax, even my two copies of genuine M42 to K adapter have a tiny play in the K mount and it is a shame; otherwise, the smooth focusing along with the size of the pancake lens is a real bargain. I am also looking for a better M42 to K adapter other than the genuine adapter. Yes, I do know that I am going up against the adapter that I highly recommend over the 3rd party ones but I do hear from other M42 enthusiasts that the expensive Kipon M42 to K adapter is better built than the genuine adapter. Last edited by hinman; 01-14-2012 at 10:05 AM. I can't thank you enough for all of your thorough replies. Any preference to single one version over the other? Does the third look very differently shaped, I do recall seeing one for Leica and it looks very different than the M42 version. I need a picture of the 3rd to confirm and I will post one when I find one handy to share. The 2nd one is likely the silver one posted in the earlier reply from Jools. Much thanks, you have made my search much fruitful and at ease. I will hit the LIKE button next. And for all Industar 50 interested members, please LIKE the post from Geoff -- it is very informative to say the least as the filter/cap/hood size are not something that you can easily find. Last edited by hinman; 01-14-2012 at 10:12 AM. 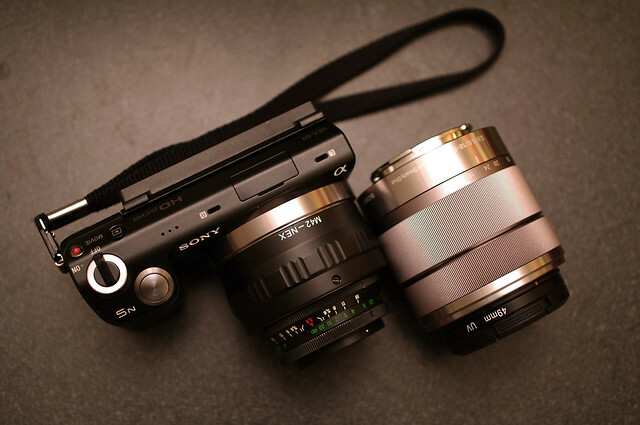 Other than the infinity focus, do you find similar optics and performance on the two lens that you have in M42 and M39? On the M39 version, I had no problem with infinity focus, just sticky focus. IMHO the M42 version performs a bit bitter -- newer coatings maybe? Mine were definitely different eras -- the M39 was #N6328612 (1963?) and the M42 is #7372643 (1973?). My scale is only accurate to 10g intervals; my M39 weighed 60g, the M42 is 70g (closest approximation). So their builds are different. I do prefer the M42. I am also looking for a better M42 to K adapter other than the genuine adapter. I just use a cheap Bower adapter, remove the screw and clip SO I DON'T GO APESH!T! and use a rear lens cap to wrench the adapter on the lens. No problem. INFINITY FOCUS: I've had no infinity focus problems with either version. I do hear complaints about not reaching infinity with the M39-->M42-->PK adapter chain. There is a pretty easy solution: MOD THE M42-PK ADAPTER! I found this whilst fitting Exakta-mount lenses to PK. Exakta register is about 0.8mm shorter than PK. 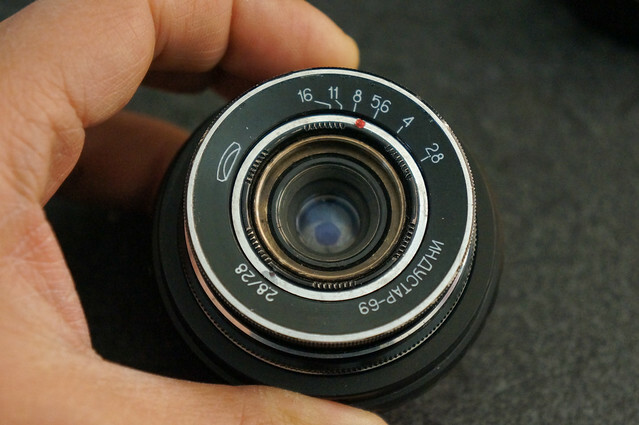 But I find that grinding about 0.6mm from the adapter lets the lens seat close enough for infinity. With Exakta, remove and save the index screw, then glue a cheapest M39-M42 ring around the bayonet. While the contact cement dries, tape a piece of coarse sandpaper to a very flat hard surface like a ceramic tile. Use a block of wood or rubber as a grip to press down on the adapter, to grind away at the narrow flange. Test occasionally for infinity focus and stop grinding when it's achieved. Don't grind too thin; at least 0.2mm of the narrow flange must be left, or the adapter won't seat in the mount. A thinned adapter should work on any narrow-base M39 or M42 lens that doesn't reach infinity. And of course the thinned adapter can be used with many lenses. And for close work, just use a stock (unmodified) adapter, or even a wide-flange no-infinity-focus (NIF) adapter. My ultralight minikit now contains (at times) Exakta-mount 40mm and 50mm lenses (with a 105mm nearby) and the I-50-2; thinned, unthinned, and NIF adapters; and a couple thin M42 macro tube sections. Great flexibility there! Last edited by RioRico; 01-14-2012 at 11:35 AM. It works great as a regular lens too, but MFD is too long for me to like it as a walkaround lens - I like lenses that can get close to subjects. As for adapters, the ones from rainbowimaging are inexpensive and well made. I got two over time and they both worked great. As you probably know, only the original adapter can be removed with a fingernail - the others require the use of a key, but other than that they work great. Oh, I forgot to mention: on the multiple versions, I heard that the earler I-50 design is not as sharp as the I50-2. I don't expect there is much difference between the Zenit SLR M39 version and the M42 ones, but I expect the Zenit M39 may be tricky to adapt. The I50-2 is the safest bet. I've got two, one is the M42 that I use on my K10, the other is the M39 with extender that I use on a Zorki 4K. I love them, they are a fiddly little lens to use but they are a very rewarding lens. It's not a quick point and shoot lens, and for me that's one of the attractions. It slows me down so I think about what I'm doing. I have LIKED your post with valuable information. And the MFD is something that bothers me more on this lens than the awkward way of aperture change in lens front. With Jool's test pictures and your inputs, it give me strong incentive to try out extension tubes on this lens. The pictures posted by Jools on the lens with extension tubes are quite outstanding in both the sharpness and bokeh. I may have become more pickier than before on the use of M42 lenses. I found the extra play in my genuine M42 to K adapter bothering me much in using this M42 lens. I will try to remount the lens in my other 3rd party adapters and see if I can get any better. Thanks for tip on RainbowImaging adapter, I have quite a lot of other NEX accessories from this company and it seems quite a good place to go. Much thanks for your valuable inputs especially on your detailed tip on thinning adapter. 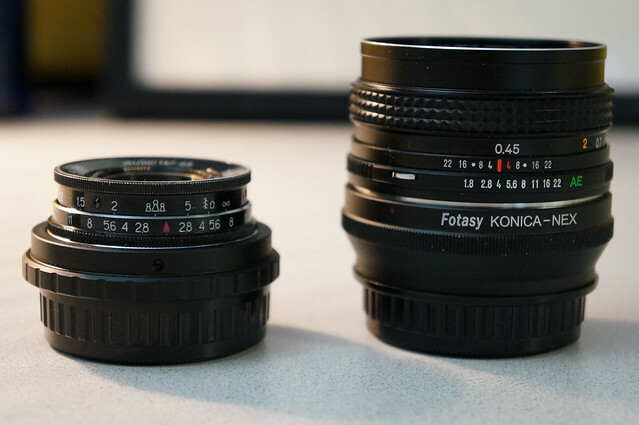 Konica AR 40mm f/1.8 -- can only be adapted to NEX and MFT, Sony A mount, and perhaps few others with adapter. 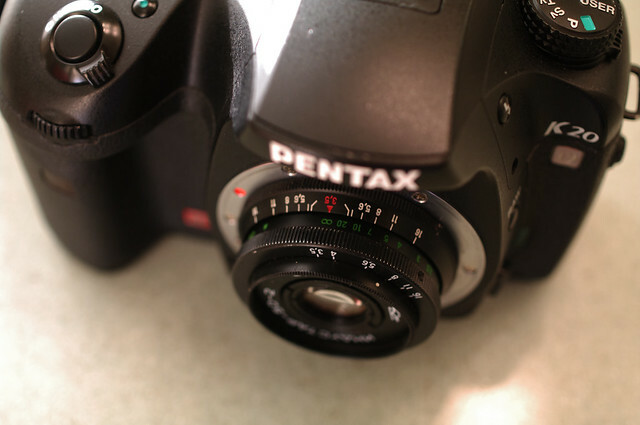 This lens is not compatible in Pentax K. I saw someone modifying the AR mount pancake to K mount but it is quite involving as the register distance from Konica AR is quite a work out to get it to work with K bodies. The Konica is quite a value pancake to get for NEX or MFT cameras. 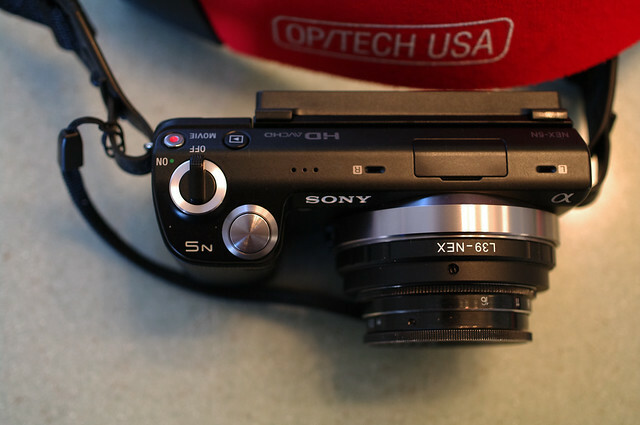 I shot a weekend with Sony NEX 5N and you can see my blog post on Konica AR 40mm f/1.8 pancake and according to other user in NEX forum, they prefer the Olympus Pen-F 38mm f/1.8 but that will be 4 times the cost of my my Konica. Last edited by hinman; 01-18-2012 at 12:23 PM. With Jool's test pictures and your inputs, it give me strong incentive to try out extension tubes on this lens. This is one of the classic setups for cheap.macro shooters: an I-50 on cheap M42 macro tubes. I think the I-50 is still around US$25 in USA, and 50mm of M42 macro tubes are about US$8. That's enough for 1:1 magnification. For 2:1, buy another set of tubes. When using M42 extension, a cheap safe wide-flange NIF (no infinity focus) M42-PK adapter is just right. Scrape the paint off the adapter base so it (safely) shorts the lens-mount electrical contacts, and you can use CIF (catch in focus). NIF adapters will absolutely seat the lens firmly on the camera, will never get stuck, are easy to remove, etc. I use such adapters with any M42 lens for shots where infinity doesn't matter. I am with you on your assessment and they are quite rewarding given the relatively low price that you can find in eBay. The focusing ring takes some time to get used to. Once I find a suitable lens hood and lens cap and a set of extension tubes, I will surely enjoy this lens more.